NBASE-T technology is significantly impacting the market with the biggest transition we’ve seen in campus switching since 2000. That’s a bold statement backed up by data and trends we’ve noted in our extensive research in the campus network market. With the new generation of 802.11ax access points supporting NBASE-T ports, this trend will only accelerate. 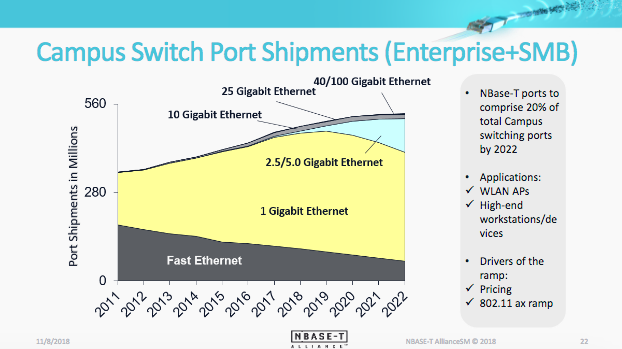 At Dell’Oro Group, we predict a major refresh of the Ethernet Switch Campus market as 802.11ax shipments ramp up, taking NBASE-T to 20% of campus switch ports by 2022. This transition will enable enterprises to transform their networks, support new high bandwidth devices, and provide the “always on” network experience expected today. One clear example of this growth is in the education market. One administrator we spoke with said they are seeing big differences in their freshman class use even from one year to the next. Each incoming class is taking a step up. They use to plan their network needs based on 3 devices per student, and that has jumped to 5 devices per student in just the past couple years. Devices like Amazon Alexa and gaming devices have become even more prolific, and the number of users has also jumped from 10K to 22K in that same timeframe. Members of the Dell’Oro Group team including Tam Dell’Oro, Ritesh Patel and myself, recently discussed these findings in a webinar with Peter Jones of the NBASE-T Alliance. NBASE-T Campus Network Market Update from Dell’Oro Group includes significant data points, price trends and discussion on the mix between 2.5GE/5GE. Decision makers can use this information to inform their strategic infrastructure plans and purchases. Dell’Oro Group reports provide more in depth findings on Campus Networks – Wired and Wireless report, Ethernet Switch – Campus report, and Wireless LAN report. We see 802.11ax driving the continual growth and expansion of NBASE-T adoption in a vast range of markets. From the high end to the low end of the market, there is a broader range of product offerings happening in a shorter timeframe than with most previous technologies. Across the industry, NBASE-T technology is clearly powering a major inflection point in campus networking.